Ownership / Access: Von Schinkel family, Private residence. Notes: Tido Castle (Swedish: Tido slott) is a castle outside Vasteras in Sweden.The first building on the site was a medieval house built by the Gren family in the fifteenth century. 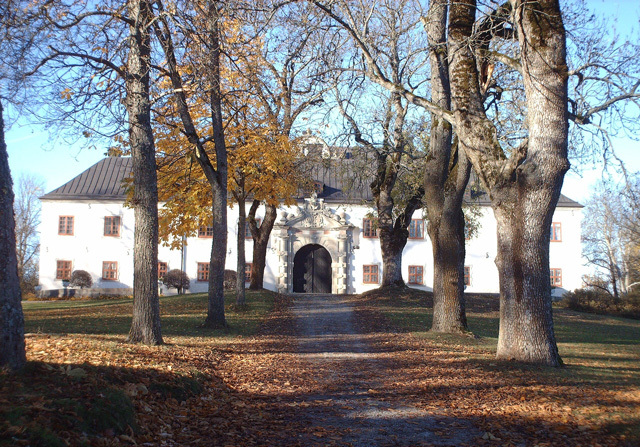 In 1537, the Gren family sold the castle to the Queen consort, Margaret Leijonhufvud. In 1540, her husband, king Gustav Vasa, traded the castle to Ekolsund Castle and Tido came to the Tott family. Today, minor ruins of the former house can be found next to the present building.The present castle at Tido was built by the influential statesman and Lord High Chancellor Axel Oxenstierna in 1625-1645. The castle was built around a rectangular courtyard with the main building to the north and the three linked wings to the east, west and south. The main entrance is through a vault in the south wing. In 1889, the von Schinkel family bought Tido and they still own it today. Today visitors may see the Toy Museum. Tido is one of Sweden's best preserved Baroque palaces, in the Dutch Renaissance style.